We’d love your help. Let us know what’s wrong with this preview of The Undead Key by K.R. Connor. With the waking of Drake set to take place during the red moon Max and Alex fight to survive. With a love stronger than she has ever experienced before Alex realizes that Max is the only one that can calm the new powers that is dwelling deep inside of her that she struggles to control. With the help of a group of Hunters and friends of Max they can only hope it will be eno With the waking of Drake set to take place during the red moon Max and Alex fight to survive. With a love stronger than she has ever experienced before Alex realizes that Max is the only one that can calm the new powers that is dwelling deep inside of her that she struggles to control. With the help of a group of Hunters and friends of Max they can only hope it will be enough to stop Hell on Earth. With her sister Jasmine taken from her and turned into something evil Alex finds herself in a horror from which she may never return. Good may not prevail. To ask other readers questions about The Undead Key, please sign up. ‘The Undead Key’ written by K. R. Connor is a piece of well-made fantasy fiction, a first part in future series that tells a story about the eternal fight between good and evil. With the waking of Drake planned to take place during the blood moon, Max and Alex need to fight for their survival. A love stronger than she has ever experienced before, Alex is going to find out Max is the only one who could tame new powers dwelling deep inside of her, she struggles to control. 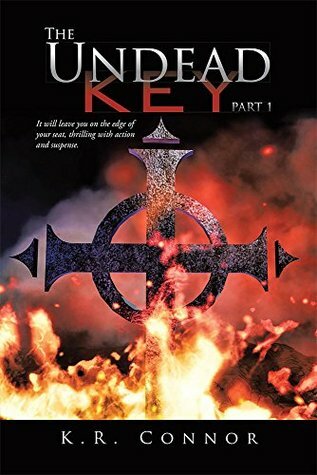 With the help of a group ‘The Undead Key’ written by K. R. Connor is a piece of well-made fantasy fiction, a first part in future series that tells a story about the eternal fight between good and evil. With the waking of Drake planned to take place during the blood moon, Max and Alex need to fight for their survival. A love stronger than she has ever experienced before, Alex is going to find out Max is the only one who could tame new powers dwelling deep inside of her, she struggles to control. With the help of a group of Hunters and friends of Max, they could only hope it will be enough to stop Hell on Earth. The well-rounded characters and a nicely conceived story both make K. R. Connor’s work a recommended read for fans of fantasy fiction literature. The author managed to create the original book that offers in same time lot of dramatic twist and turn situations, interwoven with well-conceived action scenes. Therefore, if you are searching for good and original story from the author still not worldwide known, ‘The Undead Key’ could be your reading choice worth the consideration and promising start of new series. If you love vampires and demons with an enticing story line. This is the book for you with characters that draw you into their lives and all the trails they face. You can't help but be enthralled by the love Alex and Max share. This is a must read, a definite page turner from start to finish. Blood Moon is a fantastic story of endurance, love and strength. It will leave you wanting more and dying for the next instalment. As a first time reader of K R Connor's books, I have enjoyed getting into e If you love vampires and demons with an enticing story line. This is the book for you with characters that draw you into their lives and all the trails they face. You can't help but be enthralled by the love Alex and Max share. This is a must read, a definite page turner from start to finish. I enjoyed Blood Moon, A quick entertaining read with great characters and settings..
A intriguing Vampires and demons, GOOD verses EVIL story. This is a new author to me and I look forward to reading more.